Leaving Zion, we drove eastwards, through a remarkable rock landscape, and then turned south to Kanab, where we stopped for lunch at a nice cafe that Candace spotted, the Rocking V. Afterwards, we continued southwards, on down to Arizona to the North Rim of the Grand Canyon, (10/11-12), where we set up the tent again, and in the few hours of remaining daylight, began to explore the views and prospects offered by the road system and its adjoining trails. We watched the sunset at the tip of the Kaibab Peninsula. That night, it was very very cold, well below freezing, and very windy, but the next day proved to be clear and rather calm, if crisp. The color at the North Rim was exiting; lots of yellow-leafed aspen trees shimmering in the sunlight, losing leaves in the fall winds. More amazement at the great chasm, more hiking, this time southward on the Kenpatrick trail from Imperial Point. 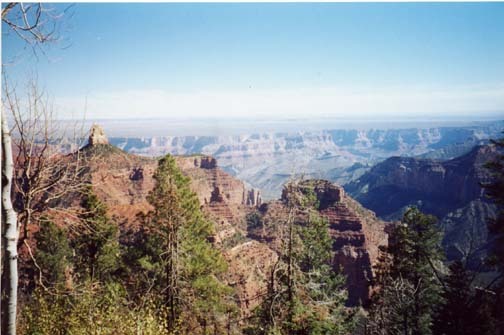 We had some lunch at a picnic table near one of the view sites, and even took a little nap, before moving southward to the tip of the Kaibab Peninsula where we again watched the sun go down in the west. Most of all, we enjoyed the eastern prospects that looked out over the desert to the east to Navajo Mountain, and the Hopi Mesas we were later to visit.